Here is one more, and promised to be the last mention of turkey. For a while anyway. I had made turkey broth and froze a quart of it for future use. The opportunity to use it came up when The Clone asked for soup this weekend. She loves noodles, and soup, but rather than giving her her usual dose of Ramen noodles I decided to give her something a little healthier. Very simple to make, just add noodles to the boiling broth. The broth was so well flavored that I didn’t have to add any additional flavoring except for a spoonful of sinigang mix (tamarind flavor) to add a bit of sourness. 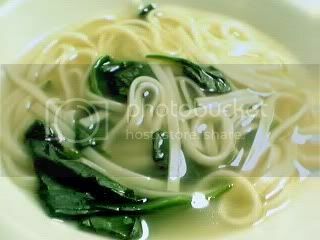 When the noodles are tender, add a handful of spinach, and cook just until the leaves wilt and change colors to bright green. Jade and I added a dash of chili paste in our bowls, and it was delicious!